Christmas is all about the children. I mean apart from the drinking a skipful of alcohol before breakfast and eating your own body-weight in food you wouldn't consider eating if you were starving at any other time of the year, Christmas is OBVIOUSLY all about the children. For the past three months almost my every waking thought has been about Christmas. I have listened to hints carefully, even the ones delivered with a sledgehammer at 3,000 decibels. I have considered, mulled and faffed. I have scouted, sourced, sought out and shopped until if I haven't actually dropped, I've started to wilt dramatically. And all those hours and hours and HOURS, like drippings from a pipette are distilled into the brief moment of time when it's time to unwrap the presents. 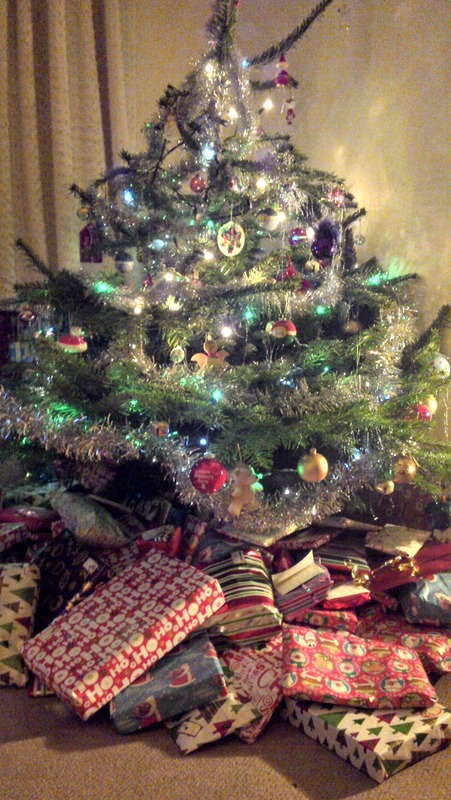 The Boy tore into the present pile like a starving man in an all-you-can-eat diner. Within minutes to all intents and purposes he mutated into a (slightly sticky) automated unwrapping robot. That shrieks a bit. ... repeat until the end of the pile. Basically. Of course, he's six years old. Christmas is Christmas. Presents are presents. It's what you do when you're six years old, as fast as possible and squealing. He might not actually realise what his presents WERE until about May, but you know, he enjoyed himself. But the magic of Christmas still remains as a stubborn twinkle in the eleven year old's heart that starts to burn a little brighter when it's revealed that not ALL her presents are soft, some of them are quite hard. Entertaining, unexpected surprises that she didn't really know she wanted but suddenly are totally, definitely and utterly what she wanted, even if none of them ARE an iPad. Being seventeen at Christmas IS a bugger though. Particularly if your seventeenth birthday was three days before Christmas and you're still up to your elbows in birthday presents and are expecting nothing more than a pile of pants and socks under the tree. Christmas this year for the TeenTwins was an anticlimax, they lolled nonchalantly on the sofa with studied indifference apparently uncaring whether there were presents for them under the tree.That lasted for all of the three minutes it took them to become aware there WAS presents for them under the tree and none of them were pants, or socks. When they all declared it; "The best Christmas ever" I didn't actually lap the room, punch the air and have a medal ceremony for Top Mummy but I might have done if they hadn't been watching. No, I just waited until they'd gone to bed. Well done you! Not an easy job making Christmas brilliant for such a range of ages I bet, glad they all had a great time - hope you did too. Sounds like you did a good job. I have a sulking 11 year old too. x popping in from the blog hop.